The fridge and freezer are two of the most important appliances in your home. When you stop to consider it, they're constantly running, and they're almost certainly being used more often than any other household appliance. To make choosing this essential item simple, we stock top mount, bottom mount, side by side and french door fridges. 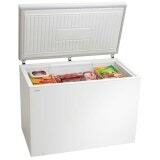 We also stock standalone (upright or chest) freezers for those who need more space or prefer to buy in bulk. Our whitegoods brands include: Beko, Westinghouse, Fisher and Paykel, Electrolux, LG, Kelvinator and Samsung.